I joke about the fact that I would not make a good celebrity. I have no want for doing drugs. Drinking is not something I indulge to embarrassing excess. In the current day and age, sleeping around is a dangerous game of roulette. And I am not one for opening up my mouth and speaking in a stream of consciousness. Ah, but I love to eat. Paparazzi would grow tired of waiting in front of restaurants to snap photos of me partaking of some delectable dish. Tabloids would say that Gino eats constantly but somehow manages to maintain his athletic physique. His life is boring. Doesn’t the man do anything worthy of tabloid fodder? A month ago I had gone to an Ethiopian coffee-house in Chicago’s Rogers Park. Because I was only passing through then, I wanted to return for a proper sit-down. I remembered how outstanding the service was. I also recalled how mouth-watering the food was that I had ordered for take-away. The temperatures in Chicago had been chilly, so I had spent most of my days inside. But with a mild reprieve from the nippy temperatures, I wanted to pander to my vegetarian palate. 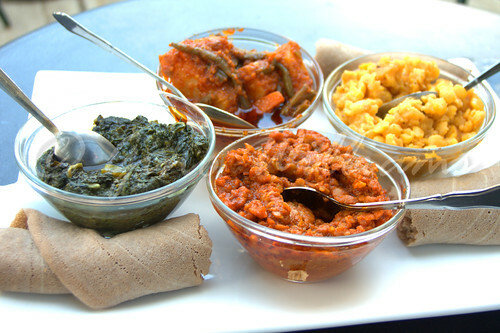 There is no way that you can go wrong with Ethiopian food. It was back to Royal Coffee at 6764 N. Sheridan Road for my moment of food reckoning. The manager recognized me when I returned. She was sitting with a friend, engaged in conversation before looking up and greeting me. There are countless restaurants where I have gone on ongoing basis only to be greeted as though it was my first visit or as if I had painted graffiti on the front door. But at Royal Coffee I got a “hello” that made my trip worth more than its weight in gold and I had not even placed my order. 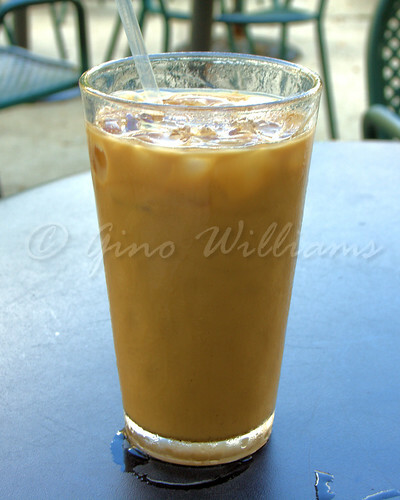 With the weather being nice, I ordered an iced coffee with milk and a vegetarian plate. Ethiopian coffee is strong and having milk added only takes the bite out of it a little. Strong and good are the only two descriptions that I can use to describe the coffee as I am sure the spirit of Juan Valdez is not appreciative of my shameless plug for how much I enjoy Ethiopian coffee. After a few minutes of reminiscing about my old neighbourhood, the food came and I snapped back into reality. 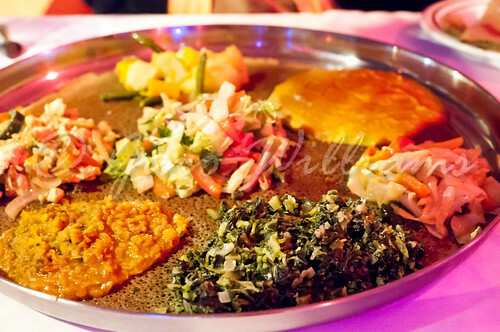 The spiced spinach, yellow lentils, red lentils, and the potatoes and peas served up with injera bread were outstanding. Each dish came in individual bowls and after I had unrolled the injera bread and spooned each on to the bread, I was ready for action. With each bite I had all I kept thinking was Wow! I have been to almost every Ethiopian restaurant in Chicago and find it hard to say which one I love the most. Now Royal Coffee makes it that much harder. Because I love spicy food, I ordered the vegetarian plate with kick and it was quite evident when I could feel heat rising from my scalp. Yes! Yes! Yes! I had my usual out-of-control appetite because I finished the entire vegetarian plate. It was practically for two people, yet I polished it off solo. Now that would have been a tabloid feature — celebrity Gino ate a sizeable plate of an Ethiopian dish and then ordered something else. The something else was dessert. Most Ethiopian desserts are full of nuts and while I don’t have a nut allergy, I have no love for the taste of nuts. I do smile when I see chocolate, though. 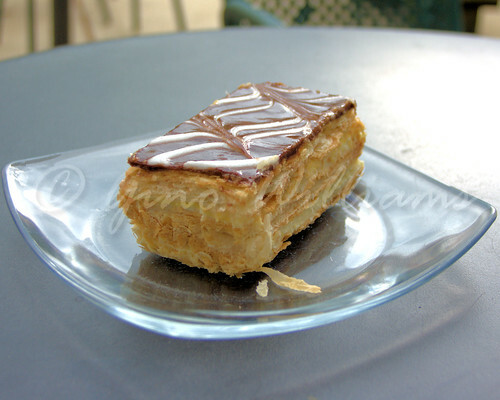 So I had a Napoleon. The flaky crust, cream filling, and chocolate topping were well worth filling the room I saved in my belly. Oh how I enjoyed forking that rectangle of goodness into my mouth. My former roommate had mentioned that she was in the area, so I sat and waited for her. 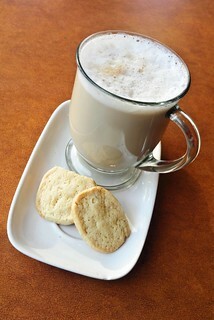 While waiting, I had a large cup of cafe au lait with some homemade butter cookies. I have gotten to the point where I take my coffee without sugar. I was almost certain that I would need some sugar because Ethiopian coffee is so strong. Still, I required no sugar. I am convinced that Ethiopian coffee is made from a superior bean or the roasting method at Royal Coffee is remarkable. As to the cookies, bakeries that bake butter cookies that turn out to be compact sugar should have a few of the lovelies from Royal Coffee and correct their recipes accordingly. The cafe au lait and cookies were a perfect match. Royal Coffee is one of those modest cafes that has no flash and flare, but everything about it makes it a magnet that draws you back for repeat visits. The coffee was superb, the food was spectacular, and the service was outstanding. I love Logan Square — where I live — and the feel of community at all of the eateries and specialty cafes, but I will certainly give in to the pull of Royal Coffee that keeps me catching the train back to my old neighbourhood. And when my friends who live in Washington, DC, come to Chicago and want a restaurant to compare to the fantastic Ethiopian restaurants that DC has, I can now add Royal Coffee to the list. Add it to your list. The only regret you may have is not having added it to your list well in advance of now. It was a Saturday afternoon in Chicago and the temperatures had warmed up enough that going outside was mandatory — for the following day would come and the temperature would be frosty or the weather would be bleak and rainy. With such great weather to enjoy, what better way to round out a fantastic afternoon than to add a little spice. A little North African spice was perfect. After a break from going to various ethnic eateries in Chicago due to being abroad on personal holiday, I was looking forward to putting my feet under some table and getting fed. Destination: Zebda. 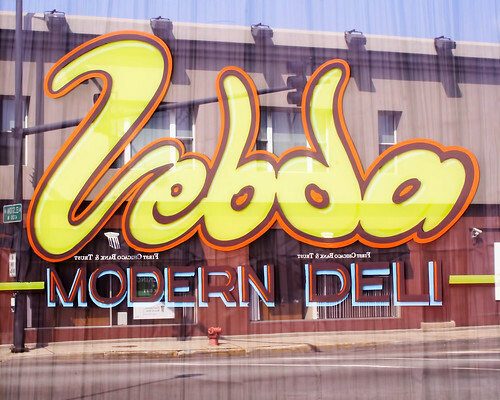 Located at 4344 N. Elston Avenue in Chicago’s Old Irving Park neighbourhood, Zebda looks like a minimalist deli that has nothing to offer except for an empty store-front. But looks can be surprising, as cliché as that sounds. I had ordered from Zebda before on GrubHub.com, so I knew that what was on the menu was a very small sample of what was on the entire bill of fare. The owner, who was a jolly yet reserved guy, greeted me a bit stiffly until I let some French slip during my greeting — proper French, not cuss words — and then it was on. 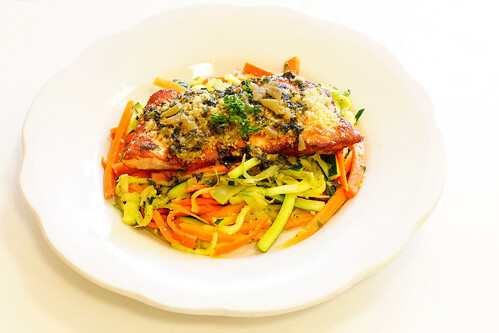 Zebda is primarily in the business for take-away orders and for delivery. There are only two tables in the deli, but that was okay. There was a true hole-in-the-wall feel to the place as a result of the limited seating. So it was off to one of the tables for business. I had ordered a harrira, which is a traditional soup that Moroccans and those influenced by Moroccan cuisine partake. The first time I ever had harrira was courtesy a friend’s sister when I was in Morocco many years ago. 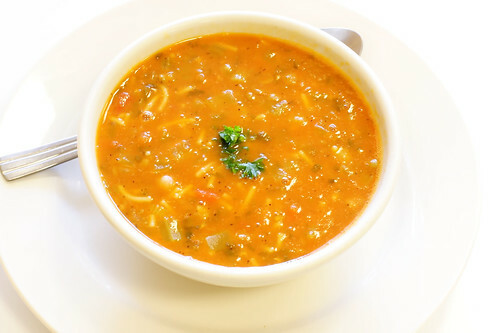 I had fallen in love with the soup then and, of course, have tasted a fair share of attempts from restaurants at it. Then I have some at Zebda and I am addicted fully. I was absolutely pleased after the first sip when it was apparent that the cook had not held back on the spices. I loved it, absolutely loved it. Instead of rushing my main dish out after seeing that I had only finished half of the bowl of soup, the owner had conversation with me instead. He told me about how the deli has been in business for a few years and how they are accommodating the palates of those from Morocco, Algeria, the whole of the Mediterranean, and North Africans who have lived in France. Noticing the passing faces and the languages spoken in the area where the restaurant is, it was clear to see that there is a heavy concentration of North Africans in the Old Irving Park area, not along Broadway where there is a solid concentration of Western and Eastern Africans. The owner went on to give me the meaning behind the word zebda and how it is used among Algerians in France as a term of endearment. Sweet, I thought to myself, nothing like going into an establishment to spend your money and you get treatment like you are family. I loved it and coupled with the fact that the soup was a bowl of heaven, the ease of interaction with which the owner had with me made my decision to return that much easier for me. When I finished the entree and sat for a while, the owner approached and offered me tea — on the house. More and more I am finding that it is not just me clicking away with any one of my high-end cameras that gets me something extra or an item coming up missing on my final tab. It has to be me engaging the owners and/or staff in conversation as well as enjoying the food and their service. A limitless palate and an open mind are necessary ingredients for a recipe in top customer satisfaction. But back to the tea. 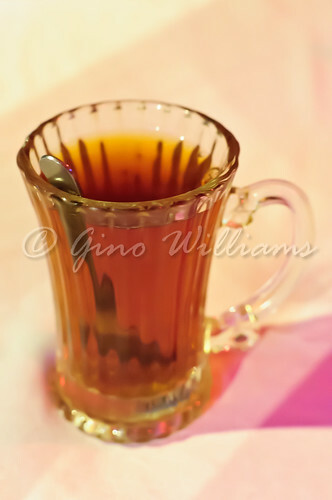 The tea was peppermint tea served with the mint leaves in it. 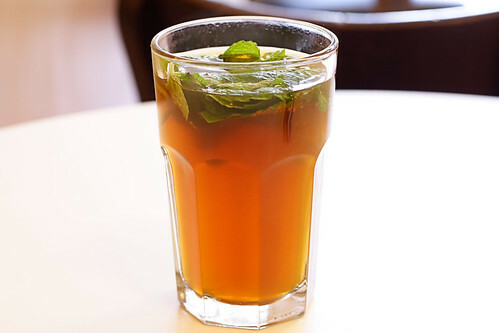 And having a familiarity with North African culture, mint tea is not just merely for drinking, but it is a symbol of hospitality and tradition. Small things like the offering of tea makes my visits to restaurants and eateries like Zebda worth the trips. Even my British sentiments, that which loves tea, enjoyed every sip. Zebda has a fantastic menu and for those whose palates delight in tastes from North Africa and the Mediterranean, you will find great pleasure in partaking in the wonders of Zebda’s kitchen. The brick and mortar establishment is small and it really does have only two tables — three chairs — so going with a large party is not an option. 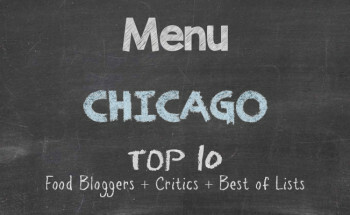 The service was top, the price was a sure invitation back, and the food was super. For those of you who are vegetarian, North African food will hit the spot. Let Zebda take care of that for you.